The Old Dark House was nearly lost forever. 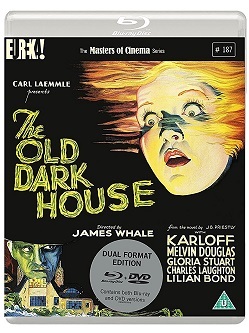 One of the horror movies crafted by Universal Studios, it was rarely seen after its initial release, despite a starry cast and part of the cycle that included such favourites as Dracula, Frankenstein and The Invisible Man; not coincidentally, the director of those latter two was the same director of this, James Whale. He was a British expat in Hollywood who gathered around himself actors who were in the same position, geographically speaking, and nowhere more so than in this macabre send-up of the Gothic chiller tradition that was proving so lucrative for Universal in the nineteen-thirties, indeed just as Warner Bros became known as the social crusaders, they were marked out for their shocker titles. Of course, time passes and there's not much to shock twenty-first century audiences about movies from early last century now, unless it's a reputation for sexism and racism which is sometimes deserved, other times not. But whereas the Universal efforts from that era with monsters went into revivals in cinemas, broadcasts on television and home viewing releases, The Old Dark House hit the curse of the remake, as William Castle helmed one in the sixties, and that pretty much scuppered its chances of ever being seen again for there was no perceived profit in it - make no mistake, it's money, more than memories, that keep films alive. Fortunately for movie buffs, one of their own was by then working for the organisation. He was Curtis Harrington, and he would make some cult horrors of his own, such as Games, What's the Matter with Helen? and Ruby. Having known Whale in a social capacity, he wanted to pay tribute to his friend and arranged it so that a negative of The Old Dark House was restored and new prints were struck, thus saving it, though even then it was rarely seen. Luckily for aficionados of these vintage gems, in 2018 it was restored for a new release, and looked and sounded as good as it had done back in 1932 when it was originally unleashed on the world, maybe better, while the remake was forgotten by all but those who followed Castle's career. Which was all very well, but this would not have counted for much if the work had not stood up to the passing of history. The thing was, Whale had envisaged his adaptation of J.B. Priestley’s "state of the nation" novel Benighted as a quasi-spoof of the Gothics he had grown up with and were making their way to the screen: 1927's silent version of The Cat and the Canary was an obvious predecessor in the way it mixed the grotesque and the humorous. Whale delighted in a very particular sense of humour, which would be described as camp nowadays, therefore when he wanted to laugh about his material he encouraged broad performances and a heightened reality that would tip over into a giddy nightmare, which was precisely how The Old Dark House unfolded with its largely British cast - they would "get" why Whale found all this amusing. Among that cast was Boris Karloff, who had become an overnight star in an uncredited role, that of the monster in Frankenstein. The same year he had made waves in supporting character parts such as Howard Hawks' Scarface, where he had enjoyed one of that movie's most scene-stealing deaths, but here he was top-billed for the first, though not the last, time as Universal were keen to cash in on audiences' fascination with him. Again, his character had no lines, as his butler at the house was a mute, and also again, Jack Pierce created horrific makeup for him to stand out from the rest who had the ripe dialogue to assist them. Once more, Karloff demonstrated his ability to have his characterisations rely on his physicality. The others in the cast were no slouches, either, as Raymond Massey (Things to Come), Melvyn Douglas (Ninotchka) and Gloria Stuart (Titanic) were present as the stranded travellers who show up at the titular building's door seeking shelter, only to be met by the crazed Femm family and their dangerous butler (Karloff) who has unhealthy designs on Stuart's beautiful young wife character. Halfway through dinner ("Have a potato," Ernest Thesiger offers repeatedly) Charles Laughton, a nouveau riche industrialist, and his showgirl partner Lilian Bond appear, and the scene is set for mayhem as the madness inherent within the crumbling walls was erupting like the thunder and lightning outside, kicked off when Karloff's brute gets drunk. The point was that now, post-First World War, Britain and indeed the world were trapped by the older generation who had sent the global and domestic community into an increasingly fractious state of affairs, and as if they were all generations trapped in a shoddy mansion by a raging storm, they were liable to see the younger torn apart by the older. What Thesiger and his sister (Eva Moore) haven't mentioned is the insane brother in the attic, and if he gets loose he is liable to murder them all with fire, as if the night was not fraught with devilry enough what with the butler getting drunker and stronger and frankly, more rapey in his intentions towards Stuart's innocent. Time and again, Whale compared the visitors' flippant need for fun with the decay they found here. Whale's embrace of the artificial in his horrors was imitated elsewhere, but in one of his contemporaries as well, Tod Browning who had emerged from the silents into the sound era with less consistency, and subsequently less control. One of his most celebrated efforts had been 1927's London After Midnight, which starred Lon Chaney Sr as a vampire with some of the most extraordinary (and painful) makeup of the day, but as that had been manufactured without sound, it, like others of the silent period, was remade with sound and music. Mark of the Vampire was the result, and proved a modest hit for MGM, but as that had eclipsed the Chaney in their view (having made money and potential for more), the original was neglected. Unlike The Old Dark House, there was no Curtis Harrington to rescue London After Midnight, so only stills were left, but more happily its reimagining survived. Another horror icon to match Chaney, and indeed Karloff, was hired to essay the role of the bloodsucker, and he was Bela Lugosi who had both made his name and cursed himself to increasingly cheap chillers with Dracula in 1930, also directed by Browning. Here, in the released version, he only had dialogue at the end of the story, as before it his other exchanges had been edited out to make the film considerably briefer, much to his chagrin, but he was generous enough to give a role to one of his fans who had contacted him after seeing him as the Count on the stage. She was Carroll Borland, and she essayed the vampire's daughter - one of the reasons the film was cut was to make it less scary and controversial, as the strict censorship code had been put into place and all references to an incestuous relationship between Lugosi and Borland's characters were excised. Despite securing the part of Luna because essentially, she had done the equivalent of winning a competition, her distinctive look with piercing stare, arched eyebrows and long, black hair influenced a lineage of Goth girls, though she wore a shroud of white rather than a dress of black. Though she did not have a huge amount to do other than bite the neck of actual leading lady Elizabeth Allan and loom menacingly, her appearance was indelible. The star was not Lugosi, but Lionel Barrymore who played a police inspector trying to work out how a vampire killer had offed a pillar of the community in this Mittel European town. Browning worked hard to conjure an atmosphere of the uncanny, but somehow by being less knowing than Whale and more tricksy, especially when you find out what is really going on, you could understand why Mark of the Vampire endured for its more bizarre touches than its plot. That was notable when the prosaic explanation did not take into account the weird sights we had witnessed which would make no other sense than it being supernatural - which was exactly how Browning filmed them, regardless of his denouement. Still, when it came to humorous thirties horrors, this and The Old Dark House were more valued than most, and we can thank their guardians for ensuring we can see them to this day.